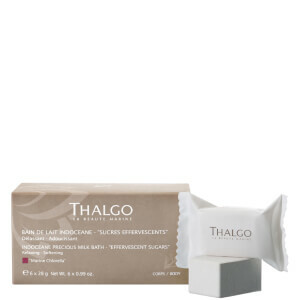 Thalgo's Ultra Hydra-Marine Mask is a nourishing formula that delivers much-needed moisture to dehydrated skin. Smoothing and moisturising, the face mask combines two Hyaluronic Acids with Sève Bleue des Océans to provide immediate hydration; it infuses skin with moisture to leave the complexion looking plumped and supple. Equipped with an integrated brush tip for easy application. Expect radiant, smooth and hydrated skin. Aqua (Water), Glycerin, C12-15 Alkyl Benzoate, Glycereth-26, Caprylic/Capric Triglyceride, Maris Aqua (Sea Water), Cetearyl Alcohol, Olus Oil (Vegetable Oil), Prunus Amygdalus Dulcis (Sweet Almond) Oil, Arachidyl Alcohol, Glyceryl Stearate, Squalane, Yeast Extract, Hydrolyzed Viola Tricolor Extract, Behenyl Alcohol, Cetearyl Glucoside, Phenoxyethanol, Sodium Hyaluronate, Hydrolyzed Beta-Glucan, Oleic Acid, Arachidyl Glucoside, Chlorphenesin, Polyacrylate-13, Parfum (Fragrance), Polyisobutene, Hydroxyethyl Acrylate/Sodium Acryloyldimethyl Taurate Copolymer, Ethylhexylglycerin, Sorbitol, Sodium Phytate, Lecithin, Sorbitan Isostearate, Xanthan Gum, Caprylyl Glycol, Polysorbate 20, Polysorbate 60, Sodium Hydroxide, Glyceryl Caprylate, Phenylpropanol, Potassium Sorbate, Sodium Benzoate, Alcohol, CI 77491 (Iron Oxides), CI 42090 (Blue 1), Citric Acid, Limonene, Linalool, Hexyl Cinnamal, Citronellol, Geraniol.